Some of the services we offer are replacing air duct filters, cleaning dryer ducts, servicing HVAC units and more. Contact us today for more. Is Your Attic A Dusty Mess? If so, it's more of a problem than you may think it is. Not only does this lower the air quality drastically which can cause health concerns, but it also allows mold to grow and spread easily. This can cause damage to your home, as well as to those inside it, so it's best to have it taken care of safely by our professionals. Let Us Handle Your Attic's Insulation! Whatever your needs may be concerning the insulation in your attic, we can take care of it for you. It's important to know that it's functioning well, because otherwise the heating and air conditioning you're paying for will be going to waste. Your home's temperature won't be able to stabilize, and the consequences won't only be a lack of comfort. Your energy spending will rise as a result, which is the last thing anyone wants! So, allow us to help! Whether your home simply needs more insulation added, to have damaged insulation removed and replaced with something fresh, or just need it installed in that brand-new attic, we've got it all covered. Have You Had Rodent Troubles? Even if they're long gone, what they've left behind is still something to be concerned about. Not only did they likely leave your insulation damaged and in need of replacing, but their waste carries harmful diseases that can easily get into your household if not taken care of. Don't worry! 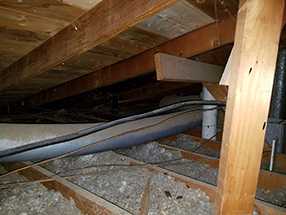 We can decontaminate every inch of your attic with a special sterilizing spray, and afterward even install rodent proofing. That way, you won't have to deal them again! Looking For More Energy Saving Options? We can install radiant barriers, as well as attic air sealing to help ensure that your energy spending isn't going to waste! You'll be glad you did. Why not take the first step to making sure that your home is properly insulated, as well as safe and clean today! Let our technicians at Air Duct Cleaning Cypress take care of it all for you, and contact us now.